Romance has always been my preferred reading during the warm days of summer, and this year we're off to a good start with a Civil War story written by Kathy Otten. She is the published author of multiple historical romance novels, novellas and short stories and is currently finishing up a contemporary young adult novel. She also does manuscript assessments and teaches fiction writing online and at a local adult education center. Kathy lives in the rolling farmland of western New York where she can often be found walking her dog through the woods and fields. She has been married for thirty-four years and is the mother of three grown children and one grandson. She is a Northwest Houston RWA Lone Star winner and Utah/Salt Lake RWA Hearts of the West finalist. 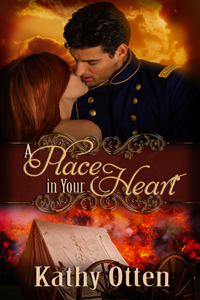 Her newest book, A Place In Your Heart is her fourth full-length novel. Gracie, please tell us a little about your life before the war. After me husband William passed away, I went back work as a maid, scrubbing floors and polishing silver for the fine houses on Beacon Hill. How did you become a nurse? William be a fine doctor and he taught me all he knew o’ medicine and healing. For six years we worked together side by side. What about your personal life? How has the war affected you and your family? Two o’ me brothers, Michael and Callum were killed at Fredericksburg. I wanted to volunteer. To use what William taught me. If he had been alive he would have gone. And ‘twas a way to feel closer to him, to be doing what he would o’ done. Who are you closest to in your life? ‘Twould have to be me da. He loves to laugh, and sing, and he always be knowing the right thing to say. His hugs make me feel safe. What is your biggest problem with Dr. Charles Ellard? The man can never explain himself. How am I to know what goes on in that great brain o’ his? ‘Twould avoid arguments if he could take the time to let people know what he be thinking. And where did the man get the notion that women be too delicate to work in a hospital? I be here to stay, and I’ll not be going home just because he believes ‘tis not a woman’s place. Dr. Ellard, what was your life like before the war? I had a small practice in Philadelphia which kept me busy. What are your biggest personal challenges these days? First, the ability to remain calm. Second, to maintain a quality level of care for my patients amid chaos, with limit supplies. And third, to find a way to work efficiently with incompetent surgeons without losing my temper. What draws you to Gracie? Aside from the instinctive biological need for man to find a mate, I find Mrs. McBride to be quite different from other ladies of my acquaintance. She appears to appreciate my medical acumen and is efficient and well organized in her work. My grandfather would like to see me marry and have children, which is something I will consider once this Rebellion has reached its inevitable conclusion. However, the number of battlefield injuries I have treated, has given me reason to question the long held opinion of medical professionals, regarding the healing properties of laudable pus. Since my assignment at Armory Square Hospital, I have had the opportunity to document various stages in the progression of healing in a variety of wounds. I have concluded that the appearance laudable pus to be a precursor to both gangrene and septicemia, rather than the start of the healing process. With continued opportunities to collect data, I hope to complete my paper on pymeia and surgical fever. If published, my findings may be the catalyst necessary to change current perceptions and create a whole new treatment regimen for wound care. Thank you, Kathy for introducing us to your new book and your wonderful characters. Any comments or questions for Kathy? For an avid mystery reader, finding a new series is always a great joy. It's like visiting a new town or city and deciding you want to stay around for a while and get to know it better. That was how I felt the moment I read the description for author Penny Ewing's new book, Dixieland Dead. I needed to know more about Penny and her new book. Now that sounds like the next book on my "to be read" list. Author Penny Burwell Ewing tells us she grew up along the pristine shores of Fort Pierce, Florida. 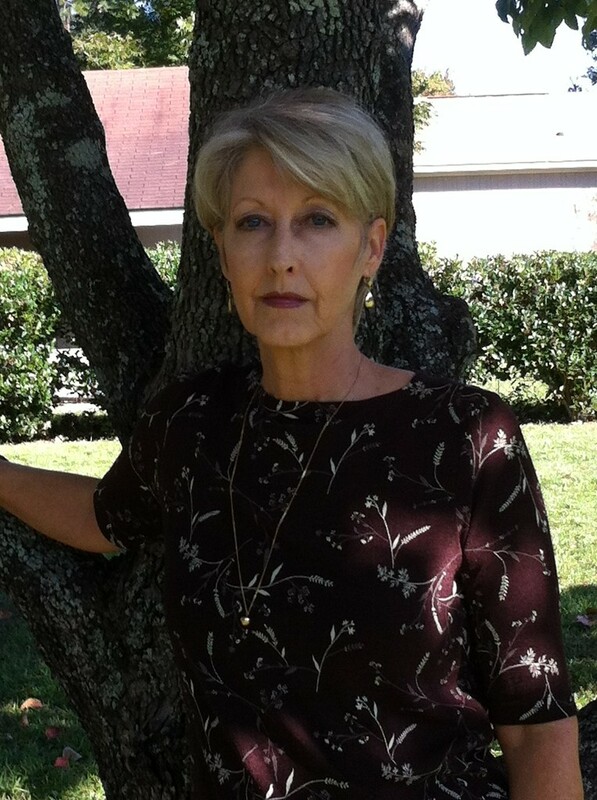 She says living in a southern coastal town gave her the best of small town living where the residents look out for one another and she adds that her love of the supernatural and mysteries lead her to write the Haunted Salon Series. After spending years behind the stylist chair, she gave up her cosmetology license in favor of a desk chair and the adventures that come with fiction writing. She says we can find a few of her hairstylist’s adventures in her books. She now lives in a quaint town in South Georgia, where she says it’s "dang hot" most of the time, and the gnats are bigger than the state bird; the Brown Thrasher. When not busy writing, she wiles away the hours with counted cross-stitch projects, crocheting, and other fine needlecrafts. She also says loves dark chocolate and blackberry wine. We're looking forward to more adventures from Penny. 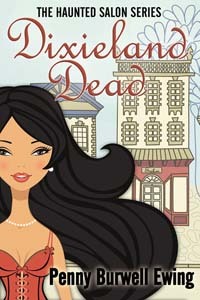 But for now let's get an excerpt from Dixieland Dead. The facial room pulled at me like a magnet. Where did the human life energy go after departing this life? Could Heaven and Hell truly be our last destination, or could we linger here trapped in the last peaceful or hellish moments of our life? Thoughts like these had troubled me since Daddy died. For years afterward, I’d studied books on the afterlife, religious teachings from various faiths, the great philosophers, and the occult, and even ancient alien theorists, always trying in vain to contact him. “Jolene’s going in there.” Deena jerked her thumb toward the closed facial room door. “Jolene’s going in there,” Deena repeated. “Wait,” I said excitedly. “I’ll get a butter knife from the kitchen.” I turned to leave, but Mama grabbed me by the arm, causing me to stumble against the door. With a thump, it flew open, propelling me into the room. As I stumbled for balance, something white fluttered in the semi-darkness. Regaining my balance, I quickly switched on the lights before Mama could protest. “I’m ready to leave, too,” Billie Jo said, joining Mama and Deena in the hallway. There wasn’t any need to try and argue my point with them—my vote would be vetoed immediately. The facial equipment was unplugged, so I turned off the lights and shut the door. A loud crash sounded from inside the room. Quickly, I flung open the door, flipped on the overhead lights, and screamed with every ounce of my being—for there, on the facial bed, sat the faint, ghostly image of Scarlett Cantrell. Thank you, Penny, for being my guest and bringing us a new mystery. Any comments or questions for Penny? 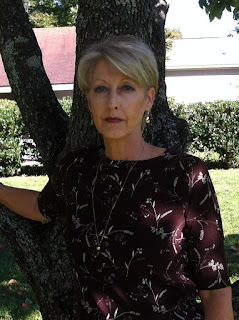 Since I normally feature various authors on my website, I get a good chance to interview authors and not only learn about what they are writing but their writing styles and how they got started as writers. I also get the opportunity to find out how they keep up with the writing process and if they have any little secrets the rest of us can learn about becoming more prolific or getting our writing done. Being a fiction writer can be a lonely task. It’s not something that can necessarily be done in a group setting. In the old days, when I was working in a television newsroom, there was the constant chatter of other newswriters all around me and people were constantly chatting or asking questions. I’m not sure how it’s done now, but the last time I visited a TV newsroom, I was struck by how quiet it was. No teletypes clattering, no typewriters, and even no noise from monitors around the room. People wore earphones and plugged into whatever they needed to hear. I wonder if they constantly ask each other questions like we used to, although I suspect that it is all done through messaging directly into the computers at their workstations. fiction I think one of the things I miss most is having other writers around to ask a question or to lament over how bad a passage is going. It’s one of the reasons I really enjoy getting together with other writers and hearing how they work or what problems they might be having. And it is always revealing to hear what people are working on or the research they are doing on their current books. And the writing process is always fascinating to discuss. 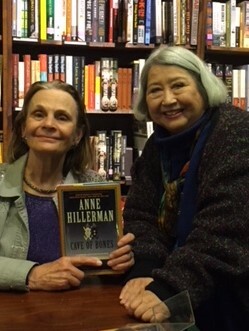 Last week I had the great pleasure of attending a book signing with Anne Hillerman and Sara Sue Hoklotubbe who both write mystery series set in New Mexico with Native American characters. Hearing them talk about how they had come up with their characters and how they worked to remain true to the Native American customs and the setting was fascinating. For Anne Hillerman, she said she felt like she had grown up with the characters of Joe Leaphorn and Jim Chee because she was there as her father wrote their stories through his many books. She said they were “practically like brothers” to her. But she has worked hard on her own to advance the character of Bernadette Manuelito in her current series. 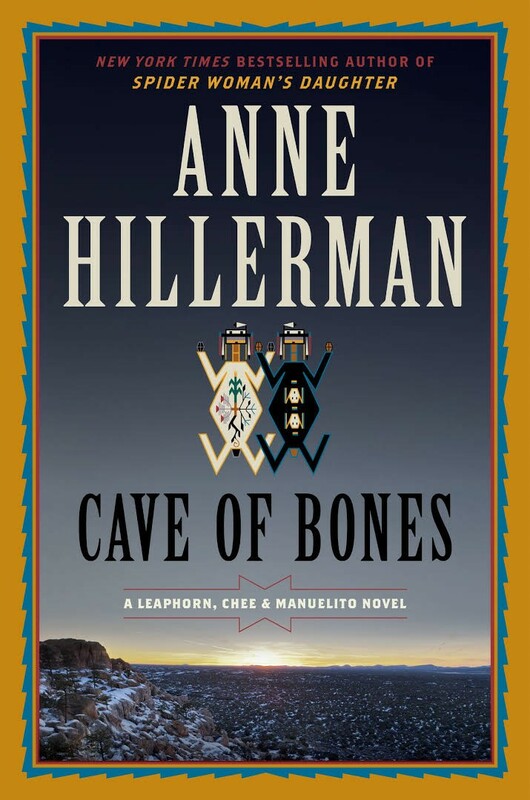 Her newest book in the series, Cave of Bones, has just been published. 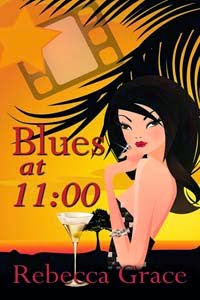 It is the fourth in the current series and as usual, the setting plays a big part in her book. She says she set it in the lava flows near Grants Pass, New Mexico because they intrigued her. Having traveled through that area on several occasions myself, I'm equally intrigued to read the book. Both authors said they try to bring out the natural beauty of the country where their stories take place. Both also said they write every day and that was the advice they had for aspiring writers – never lose sight of what you want to accomplish and work on your writing continually if you want to get those stories written. As an avid reader of her father, and now Anne's books, this one sounds like another mystery I won't be able to put down! Most weeks I am looking a different books and previewing the books I love to read, but today I’m going to deviate from that to talk about writing and the writing process. For the past few months I have been working on a sequel to my novel, Dead Man’s Rules. The book is titled Dead Man’s Treasure and it takes Freeda Ferguson, a character in the first book, on a search for her father and a lost treasure while encountering a new romance at the same time. 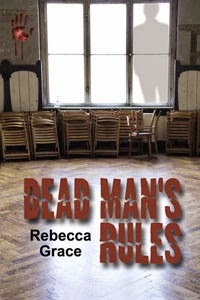 Dead Man's Rules told the story of a Los Angeles journalist who visits her mother in a small New Mexico town and gets caught up in a murder mystery. The next book takes us back to that same small town of Rio Rojo, with another old mystery that has never been fully explained. I started working on Dead Man’s Treasure several months ago and now I am ready for editing. Like so many other writers I often participate in NaNoWriMo (National Novel Writing Month) every November attempting to write 50,000 words in one month. I’ve done it for a number of years because I enjoy having one month when I really focus on writing, writing and more writing. To finish that many words in 30 days without editing, it takes discipline and daily concentration on a story. Because I don’t usually plot in advance it takes even more work to have something ready to write EVERY SINGLE DAY. Because of that I have to remember, re-establish and practice all the good writing habits I can muster and that I’ve learned in the past and that was what I did in writing the latest Dead Man story. But there is another reason I enjoy tackling NaNoWriMo. At the end I come out with a nearly fully written book. What is the next step? There can be several. Some writers some out of NaNo and immediately begin the editing process. Others will go back and find all the loose ends and tie them up and then set it aside. That’s more of what I like to do. Even writing that many words will not guarantee a finished product. For certain it won’t be a polished product. But it’s like laying the foundation for a house. The framework is there and some of the walls may be up, but there is still much more work to be done. For the first week of December I usually go back to my story and fill in some of the blanks I know I’ve left in the plot or I take the time to clean up discrepancies that I didn’t complete or fix while writing the story. So if I don’t immediately start the editing process, what am I going to do and why? When is the right time to go back in and start to edit a book you’ve just written? It all depends. As I noted, if you know there are some things that need fixing, I suggest going back in and immediately fixing them so that they don’t get forgotten or the freshness of your thoughts in writing the story don’t get away. But overall, leaving a story and letting it rest for a while is probably one of the best things you can do. Walk away from it, let it go, and then come back to it in a month or so with a fresh eye. You will find yourself looking at it in a whole new light. How long should you let it go? The one thing you don’t want to do is to let it go for so long that you totally forget the feel for the book and its characters. To me the people and places in my books are alive in their own little world. I like to visit that place, whether it is real or made up and spend some time with those characters who are always products of my imagination. But visiting that world is like walking into a real location and listening to the characters talk and seeing how they act is like a seeing them come to life. That is how it is during the writing phase, and for certain how it has to be during the editing phase. Focus on your senses. Do you feel the coldness of the winter day you were trying to describe when you first wrote the opening scene? Do you fear the oncoming darkness or feel the fear you want your heroine to feel as she watches the sun set and knows those creatures from the previous night might be returning? Listen to your characters. Do they all sound alike or does each of them have a different way of speaking so that even if you took away the tags you could tell who was talking? Are you making each character individual and making their own story come alive through their words? Consider the tension in your scenes. Is it there or do you need to make it more profound or turn the scene into something else? Does the scene move the plot forward or does it look like you’re just filling in words to get to a certain word count? Does it further define your character? Does it contain necessary information for the story resolution? In other words, does the scene even make sense? Read over each scene separately and make certain they are necessary to advance the plot or the character. If they are just filling time, then let them go—cut the scene. Make a list of your scenes. Do they all flow together in a natural progression or is there something missing that you need to go back and insert so that your story makes sense? Are there several scenes that appear to be simply strung together that either move so fast you’re feeling breathless and in danger of doing the same to the reader? What about your grammar, your sentence structure? With each pass through your book it makes sense to look for those little things and to keep correcting them so that at the end all you need is a final polish to finalize your editing. This is just a brief look at some of the elements of the editing process and no two people edit the same, but we all have to do it. Sometimes a refresher on the editing process or editing with others besides your critique group can be helpful. In the next couple of weeks, I will be teaching a class on editing for Fantasy, Futuristic andParanormal Romance Writers, and if you’d like more help with editing or even working with your characters or plot on a story you are currently writing, I’d love to have you join us.